For couples that have been there, done that, and plan to explore more, this Map Invite is a cute way to tempt your guests into attending your adventurous, fun-loving nuptials. While considering the places I have been in this world, and the places I would still like to go, I came up with this fun project for couples to showcase their own travels together. Be warned -- all the photos you're about to see are very much homemade! However, places like Oblation Papers & Press are exactly where I would take this homemade idea to make it a (more professional) reality. 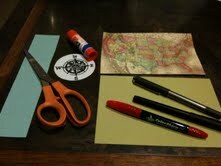 Step One: My original idea was to use a vintage map of the USA, postcard, stamp, or anything close to that. I ended up printing off a map and pasting it to card stock, much like a postcard. I found this antique looking map of the States by searching Google and pasted it to a piece of postcard-size card stock. Step Two: At this point, the Bride and Groom would mark all the places they have traveled to in their lifetime (preferably, in distinguishable colors). Places that are beyond the United States, can be referenced by drawing little arrows. Maybe even draw a BIG HEART over the spot the Bride and Groom met and fell in love! Step Three: I created a paper clasp to hold it all together and to provide writing room for anything from a little love poem, to the names of the Bride and Groom, to something as simple as "Save the date!" Step Four: From here, it's all up to you! The back of the note can provide wedding details, save-the-date information, an engagement photo -- anything your heart desires! Have FUN with this idea and let me know if it proves helpful in coming up with your own personalized invites. Remember, the more personality you put into your invitations, the better!